First up is the highly anticipated reissue of their critically acclaimed first new studio album in 14 years, The Mission, on July 27 via Alpha Dog 2T/UMe. The two-disc package will include a CD of the original album, as well as a Blu-ray of The Mission mixed in 5.1 Surround Sound by singer/guitarist Tommy Shaw and producer Will Evankovich accompanied by stunning visualizations for each of the album's 14 songs based on the album artwork. Other extras on the Blu-ray include: The Making of The Mission Documentary of exclusive interviews of SHAW and Evankovich, four music videos—"Gone Gone Gone" (official video), "Gone Gone Gone" (video created by NASA), "Radio Silence" (lyric video) and "Radio Silence" (live video from Syracuse, NY)—and three hi-res audio playback modes. Pre-orders are available now here. "The Mission, a concept album of all new music, is a trip," declares Tommy Shaw. "Now it's coming to you in 5.1 Surround and you're cordially invited to strap yourselves in and take that trip with us, then take it again!" 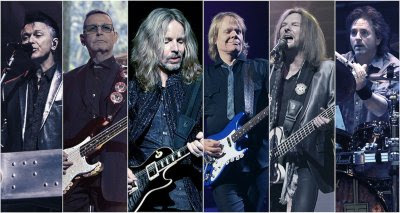 "The planets truly aligned for The Mission, and I couldn't be prouder," said vocalist/guitarist Tommy Shaw upon its release, who co-wrote the album's storyline with longtime collaborator Will Evankovich (Shaw/Blades, The Guess Who). "It's our boldest, most emblematic album since Pieces of Eight." As founding guitarist James "JY" Young continued, "In the 40th anniversary year of our release of our biggest selling album of all time, Grand Illusion, it just seemed truly appropriate to save our new studio album until this year. Needless to say, I'm very excited." Next, Sing For the Day!, Tommy Shaw's solo 2016 concert performance with the Contemporary Youth Orchestra will be released on Blu-ray, CD, and Digital Audio / Video on June 29 via Eagle Rock Entertainment. Pre-orders are now available on Eagle Rock's website. Filmed before an enthusiastic audience at the intimate Waetjen Auditorium in Cleveland, Sing For the Day! presented unique versions of such classics as "Blue Collar Man," "Girls With Guns," and "Too Much Time On My Hands." Under the direction of principal conductor / founder Liza Grossman, with accompaniment by guitarist/musical director Will Evankovich, the Cleveland-based Contemporary Youth Orchestra blended seamlessly with Shaw to create a one-of-a-kind experience. The songs of Styx / Tommy Shaw / Damn Yankees are infused with the energy of the finest high-school-aged musicians in Ohio, as evidenced by such performances as the epic duel between Shaw's guitar licks and a prodigious young violinist / CYO alum Lavinia Pavlish on "Renegade." Additionally, the set includes a special version of the Styx classic "Crystal Ball" featuring the debut of a lost verse that was never recorded. As Tommy Shaw says, "Sing For the Day!, a retrospective look at some of my favorite songs I've written and co-written, performed with Contemporary Youth Orchestra, now remixed in glorious 5.1, takes them all to a higher place I'd never imagined." This show also marked the 10-year anniversary of Styx's original 2006 performance with the Contemporary Youth Orchestra -- One With Everything (previously released via Eagle Rock Entertainment on multiple formats). In addition to the full 13-song set, the Sing For the Day! Blu-ray includes 96K stereo audio of four songs with Tommy Shaw and the Contemporary Youth Orchestra not included in the program -- "Down That Highway," "The Great Divide," "I'll Be Coming Home," and "The Night Goes On" -- soundtracking a slideshow of photos from the show, rehearsals, and behind-the-scenes. Plus, on June 30, AXS TV presents a "Saturday Styx" lineup headlined by insightful conversations and classic performances. The day begins at 1pE, as Tommy Shaw, James "JY" Young, and Lawrence Gowan sit down with Dan Rather to discuss their legendary career, the creative process behind some of their most enduring songs, and what drives them to keep performing in "The Big Interview." Next, Styx joins The Red Rocker for an epic hangout session backstage at The Venetian in Las Vegas in "Rock & Roll Road Trip With Sammy Hagar" at 2pE. Then, the band sails into Sin City for an unforgettable career-spanning set in "Styx : Live At The Orleans Arena Las Vegas" at 2:30pE; followed by Tommy Shaw's incredible performance with Cleveland's renowned Contemporary Youth Orchestra in Sing For The Day!at 3:30pE. The block will re-air in its entirety immediately following at 5pE.